Leaving my Missouri Ozarks this weekend, I found myself visiting some of the places I’ve been wanting to visit in the equally desirable Shawnee National Forest region of Southern Illinois. Towards the end of the day I wound up at Giant City State Park, known mostly for its rock outcropping features, but just as bountiful in spring-ephemeral wildflowers. 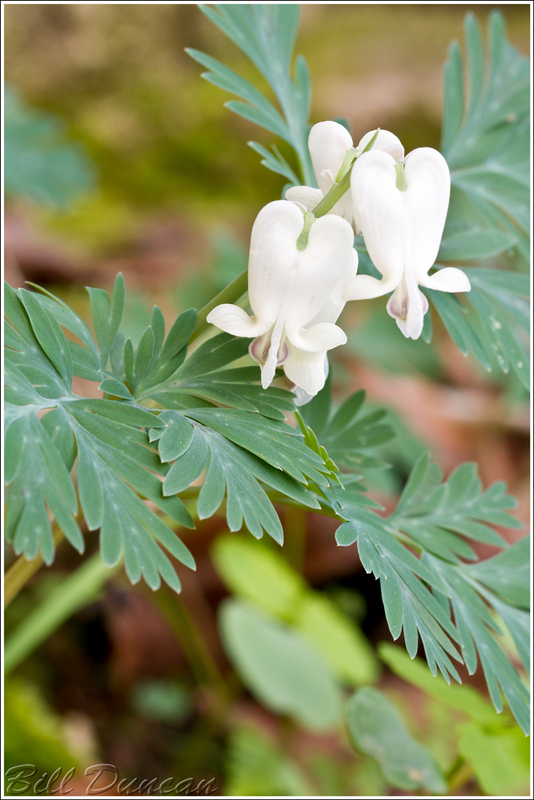 The plant featured above is called squirrel corn and is in the same genus as its more famous sibling, the Dutchman’s breeches. Unlike Dutchman’s breeches, squirrel corn is pretty rare in the Missouri Ozarks, having been found in only a handful of counties. Along a trail in this state park, the two were found in almost equal abundance. It was very nice seeing the two flowering in synch within inches of one another. The density of wildflowers here was bewildering. Colors littered the ground everywhere I looked and the possibilities for composition seemed endless. With failing light and late afternoon winds, it was challenging for macro photography. I had not yet photographed this species, nor had I even seen another species that was just beginning to bloom here – the white trillium. So, I pulled out the macro gear and went to work with sounds of recently arrived songbirds advertising their newly acquired real estates and small streams funneling their light charge of the previous day’s rain down the sandstone steps. This, unfortunately was broken too often from the idiots pounding large plastic containers against rocks for some reason. State Parks. I love them and hate them.